This is a 10 week course which prepares the students to work immediately after training as a phlebotomist/phlebotomy technician. This is a New program intended for those students who seek to work as a hospital trained phlebotomist. Vein Isolation/hematological tests associated with neonates, elderly and immune compromised patients. This is a 10 week course which prepares the students to work immediately after training as a phlebotomist/phlebotomy technician. The course meets one day per week for 6 weeks of classroom/hands on clinical practice and lecture for 5.5 hours. From week 4 to week 10 students may come to our blood draw days where they can bring family and friends. The days of the week for blood draws are on Tuesdays’s and Thursday’s at 1:30 pm. During blood draw days each student is supervised by a Phlebotomist/RN/FNP and or Registered MA. There is a no longer a fee per each blood draw to cover the bio-hazard sharps disposal fees and supplies. All 100 Draws are FREE! Students are eligible to take the ASCP upon completion of the course. If students do not have anyone that they can bring on family and friends day, we strongly urge them to come anyway and instructors will try to pair them up with other students who do not have volunteers. Phlebotomy students will be practicing on real anatomical replicas of arms molded from real people made exclusively for Phlebotomy Career Training by Hollywood FX company which makes props for many popular movies supplies fake blood. Our students are given 1 on 1 instruction by professionals. Class sizes are small ranging from 3 to 9 people. Student will be given login access to all course modules online to complete their homework weekly. Handouts will also be provided in class to each student. All of our instructors have been with phlebotomy career training since it opening in 2009 and are also all full-time phlebotomists at local hospitals. Upon successful completion of the class and 100 blood draws, The students will learn how to process lab specimens and perform point of care testing such as pregnancy tests, HIV tests, Micro-hematocrit, Blood sugar testing, drug screens, thyroid testing and much more in order to help student gain employment as a phlebotomist/lab assistant. 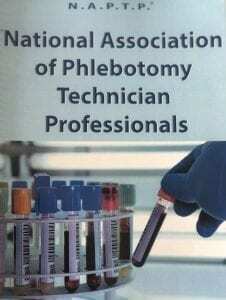 Phlebotomy Career Training is a licensed proprietary school in the State of MI. The American Medical Certification Association and the National Center for Competency Testing as well as the NHA and the NAPTP have accredited PCT’s phlebotomy program of instruction. For those students who wish to further their education in phlebotomy, we also offer clinical rotations throughout the state of MI. for phlebotomy externships, where students will complete 100-150 blood draws with the opportunity of working at the location upon being offered an interview. Please call our offices to inquire more about our courses at 734-762-3220 option 1, or email us at phlebotomycareertraining@gmail.com. We have been proudly serving the Michigan populous since 2009 and many of our students are successfully working in as phelbotomists throughout the state. Our teachers all have over 400,000 blood draws each and have over 20 years of teaching experience, with degrees to back up their educational experience. Below you will see our schedule of classes. Where you see a phlebotomy class listed, that basically indicates the day and time the class will meet. Students can expect to meet on the same day and time for 4 consecutive weeks. Students who are interested in beginning the Cardio-phlebotomy should inquire at our offices. This is a more advanced course which meets for a consecutive 10 weeks and includes classes taught on site for telemetry and Intravenous insertion certification as well as EKG/National EKG, National Telemetry and National IV examination. Students graduating with this certificate are eligible to work in dialysis clinics, cath labs and plasma centers,cardiovascular clinics, physician offices and much more. 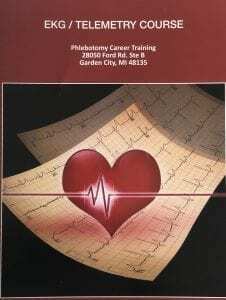 Includes new phlebotomy book and Telemetry/EKG book.